She didn’t have a magazine, Alina Wieja told me. But could she attend the conference anyway? I was in Poland in 1993, looking for a venue for our next conference, an eight-day Magazine Training Institute for Christian magazine publishers. She and her husband had founded a wholistic ministry to Polish families and she believed the next step was a Christian magazine for families. There would be articles about marriage, raising children, relationships, and more. She had never so much as written a magazine article, much less launched a magazine. But she had vision for what could be and she knew the needs and desires of her potential audience. “Of course you can come and bring your entire team,” I assured her. Before I had started the Eastern European Magazine Training Institute (now Magazine Training International) I had thought it was necessary for potential magazine editors to undergo years of university training before taking on a task as challenging as launching a magazine. But, Christians in Eastern Europe had taught me otherwise, and I had seen that vision, energy, and a willingness to learn could work miracles. It was obvious to me that Alina had all that and more. So, in April, 1994, Alina and six of her team attended the Magazine Training Institute in Ustron, Poland. Determination, hard work, and prayer followed, and months later Nasze Inspiracje was born—and with the magazine a relationship that endured over the following quarter century. Over the years, Nasze Inspiracje gained recognition in Poland. And even though she was acknowledged as a gifted editor Alina’s desire to continue to learn and improve the magazine proved insatiable. She took part in both our two-day Magazine Consultation and the three-day Magazine Design Workshop in Poland in 1995. She attended a writer training workshop in Poland in 1999 and again in Austria in 2000, this time bringing her teenaged daughter, Estera. In 2004 she traveled to Slovakia, where she participated in the Conference on Publishing Magazines for Women and served as a trainer in the Magazine Editing Course. In 2008 she attended her last Magazine Training International conference when she and Estera traveled to Prague for the new Magazine Design Course. She didn’t restrict her learning to courses. From time to time over the years she visited me in my office near Vienna, where we discussed the magazine. Alina cultivated relationships with other training organizations, including Media Associates International (MAI) in whose programs she occasionally served as a trainer. When I think of Alina I’m reminded of her desire to learn and her unwillingness to stay where she was, even when it was a good place. She was not going to rest on her laurels. She was always pushing to know more; to do better. Like the Apostle Paul, she was not satisfied with the achievements of the past. She was continually reaching forward to be ever more faithful to the call of God on her life. She was a woman of courage and faith combined with compassion for the women and families of Poland. She was able to see the need of families in Poland and imagine a response, whether that meant a magazine or other ministries. So when God called her to step out in faith to meet the need for a magazine for families she was ready. Alina had a quiet dignity. She felt no need to promote herself, and as she gained recognition and applause, she did not preen herself or look down on others. To all those who came in contact with her she was an example of how to handle success. Because Alina was reserved, she may not have been easy to get to know. I don’t remember that. When I first met her, she showed me around the ministry headquarters and told me about the work of Life and Mission Ministry, the organization she and her husband, Henryk, founded and led. In the years that followed, as I visited her in Poland and she visited me in Austria I came to know her well. We were not in contact continually, but when we did come together there was an instant connection. My last time together with Alina was in 2014, when she stayed with me for a few days in my home in Colorado. We enjoyed a warm time of conversation and fellowship. And of course, we talked about the magazine. I don’t remember what else we talked about. But, I do remember the feeling of companionship; the joy of simply being together. 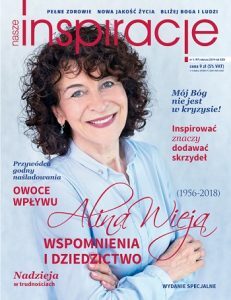 Nasze Inspiracje was meant to be an inspiration to Polish families, and although I can’t read the magazine, I can say that I have “read” the life of the editor and have been inspired. –Sharon Mumper, founder and president of Magazine Training International.